For the first five innings, David Pauley did his best Cliff Lee impression, limiting the Yankees to one run on two hits. After Mark Teixeira homered in the first inning and Arod followed with a single, Pauley proceeded to retire the next 13 batters in a row before walking Brett Gardner to lead off the sixth. That walk eventually proved to be very costly because it helped spark a four run rally that gave the Yankees a 5-o lead. No Lee. No Problem. 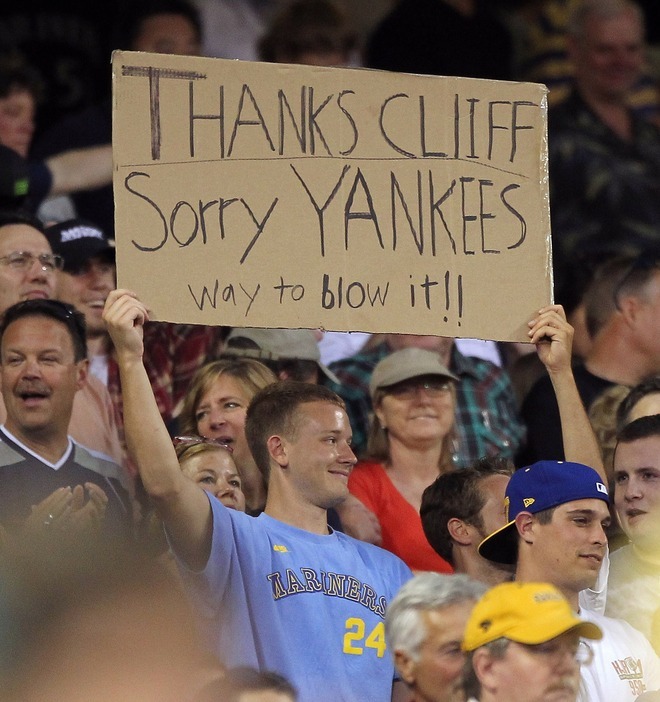 Yankees have nothing to be sorry about as rotation continues hot West Coast swing (Photo: Getty Images). The beneficiary of the offensive outburst, as he has been for most of the season, was Phil Hughes, who bounced back from a stretch of four poor starts by yielding only one run in seven innings. Following an approach he used to dominate earlier in the season, Hughes mostly relied on his fastball, which topped out at 96 and averaged an extra mile per hour over the course of the game. In addition to better velocity, Hughes also pounded the strike zone, recording a strike on over 70% of his pitches. Although his fastball did find its way off target a bit too frequently, the combination of late life and pitching ahead in the count was a recipe for success. As a result, Hughes ended the evening by joining fellow All Stars Pettitte and Sabathia as an 11 game winner. The welcomed site of Hughes returning to form was complemented by the continued resurgence of Mark Teixeira, who opened and closed the scoring with a pair of solo of homeruns. In July, Teixeira has posted a line of .353/.414/.794 with 4 HRs and 11 RBIs. Not coincidentally, the Yankees season long seven game winning streak has coincided with Teixeira’s hot streak, underscoring his importance in the lineup. In the sixth inning, the Yankees scored four runs, marking the 30th time the team has tallied at least that many in an inning. Chone Figgins sixth inning double was his first extra base hit since June 1. Mark Teixeira homered from both sides of the plate for the tenth time in his career. Teixeira’s first inning home run extended his streak of reaching base to 30 games. The longest streak of his career is 45 games, which was accomplished in 2008. After one turn through the rotation on the current West Coast trip, each Yankee starter has gone at least seven innings while giving up no more than two runs.